The Employment Cost Index rose 0.2% in the second quarter, the lowest increase since BLS started keeping track, which began in 1982. On a 12-month basis, employment costs are up 2%. This number includes salaries and benefits, so we still have wage inflation barely keeping up with inflation in general. Given the low ECI and falling commodity prices in general, the Fed has an excuse not to move in September. Bonds rallied hard on the announcement. Note that in 1982, the US was in the worst recession since the Great Depression. This was the recession caused by Paul Volcker’s tightening to conquer 1970s inflation. It also corresponded to the first wave of globalization, where US industry had to deal with international competition for the first time since WWII. Given that we are 5 years into an expansion, that number sticks out like a sore thumb. The ECI is just another demonstration of the strange state of affairs in the US labor market. People who have jobs are keeping them, as demonstrated by the multi-decade lows in initial jobless claims and the low unemployment rate. Job openings are at the highest since BLS started keeping track in 2001. The labor force participation rate is the lowest since the late 1970s and wage inflation is the lowest since 1982. Definitely a perplexing environment for the Fed to navigate. Lost in the GDP data from yesterday, GDP growth was revised downward from 2.3% to 2% for the years 2011-2014. Apparently the government overestimated what government spending was during those years. Kind of funny, actually. The Chicago Purchasing Manager’s index rose to 54.7 in July from 49.4. Consumer Confidence slipped slightly in July, according to the University of Michigan Consumer Sentiment Survey. The current conditions index rose while the expectations index fell. The number of people who say their household financial situation is worse than a year ago ticked up to 29%. Interesting to say the least, given that these consumer confidence indices often are influence by gasoline prices and those have been falling as oil has been taken to the woodshed. Speaking of oil prices, both Exxon-Mobil and Chevron reported weaker than expected numbers this morning, and both stocks are getting whacked. Surprisingly, D.R. Horton (who has a lot of TX exposure) has not seen any evidence of this hitting homebuyer demand. Ocwen missed earnings estimates and the stock is down about 16% on the open. The UPB of its servicing portfolio fell 26% to $322 billion. They unveiled a new plan to cut costs as their assets fall. The House Financial Services Committee passed a “hold harmless” period for TRID, which basically says the CFPB won’t be able to enforce TRID and impose penalties until Feb 1 2016, provided the issuer is making a good-faith effort to comply with the regulation. There is a competing bill in the Senate which would have a shorter period, ending on Jan 1. The CFPB has already delayed the implementation once. The advance estimate for second quarter GDP came in at 2.3%, missing the 2.5% street estimate. However, that may have been due to the fact that the first quarter number was revised upward from -0.2% to 0.6%. In essence, people were expecting a big bounceback from the weak first quarter, however some of that bounceback was pulled back into Q1. The consumption number was better than expected at 2.9%, and the core PCE (personal consumption expenditure – the Fed’s preferred measure of inflation) was 1.8%, just below the Fed’s target. Government spending was flattish as was private investment. This pretty much says that consumption is getting better with the labor market, however business investment is still depressed, which is probably more due to overseas concerns than domestic ones. The next big economic “tell” will be the back-to-school shopping season, which is right around the corner. The FOMC statement was a non-event yesterday. They noted continued improvement in the labor market, although they want to see further improvement before they raise rates. Given the GDP report (especially the inflation data), it is looking more probable that the Fed moves in September. Initial Jobless Claims rose to 267k after hitting a multi-decade low last week. The big question for the Fed is when wage growth begins to happen. That will be a function of whether some of the people who have exited the labor force want to (and are able to) return to the labor market. If not, then we should start seeing wage inflation sooner. FWIW, hearing anecdotally that the job market for recent college grads is strong this year. Michael Feroli, Chief US Economist at J.P. Morgan draws parallels between the current economy and that of 1966, with regards to inflation. The Fed got behind the curve and ended up chasing inflation throughout the 1970s. IMO, there are big differences between 1966 and today, most notably the lack of international competition back then. Europe and Asia really didn’t rebound from WWII until the 1970s, so the US had no competitive forces pushing prices down. That simply isn’t the case today. If anything, the strength in the U.S. dollar is keeping commodity and import prices low, which is keeping a lid on inflation. Wage growth will be key. No wage growth, no wage-price spiral. Markets are flattish as we await the FOMC decision. Bonds and MBS are down small. Mortgage Applications rose 0.8% last week as purchases fell 0.1% and refis rose 1.6%. Pending Home Sales fell 1.8% in June versus May, but are up 11.1% year over year. Pretty much no one is forecasting a rate hike at today’s meeting, given there is no press conference. There is a chance of rate volatility around 2:00 pm, but I would expect the statement to say pretty much what the various Fed speakers have been saying for a while – the economy is improving, the labor market is losing some of its slack, inflation remains contained, and the Fed will remain data-dependent. Homebuilder D.R. Horton reported yesterday, beating estimates. Orders increased 25%, closings increased 37%. Texas remains strong despite the drop in oil prices. 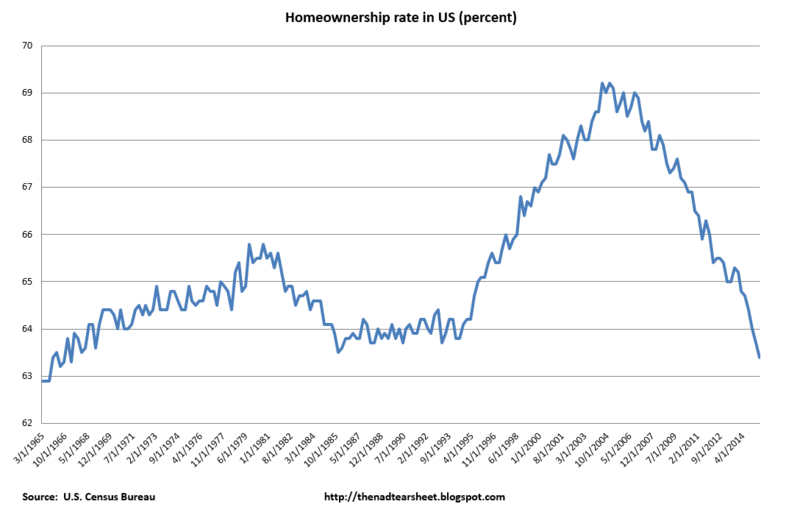 The homeownership rate fell to the lowest level since 1967. Basically all of the gains that began with the Great Bill Clinton / George W Bush experiment in using housing as a tool for social engineering have been given back. Note that household formation is finally back on the upswing, so we have a lot of pent-up demand. Yes, it is out 3 days before my retirement. After which, of course, I will never need it again. No matter whether MS “got it right” this time. I write this on a laptop I loaded with Ubuntu (Linux) only and do not intend to be captive to an operating system monopoly ever again, once I do not require legal software apps that only run on MSW. For those of you who must continue to use it, I hope it is all it’s cracked up to be. Stocks are higher this morning as Euro markets rally on M&A activity, and the 200 day moving average held for Chinese stocks. Bonds and MBS are down. The FOMC starts their two day meeting today. 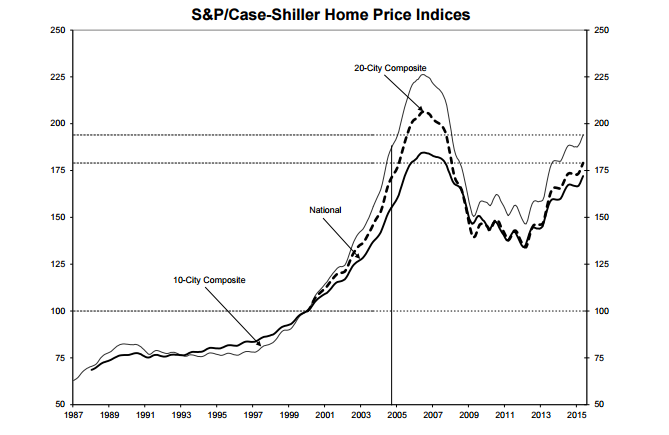 The S&P Case-Shiller index of real estate values was basically flat in May, and is up 5% year over year. David Blitzer has an important comment on the first time homebuyer, which speaks to the education challenge those of us in the real estate business have to do: “First time homebuyers are the weak spot in the market. First time buyers provide the demand and liquidity that supports trading up by current home owners. Without a boost in first timers, there is less housing market activity, fewer existing homes being put on the market, and more worry about inventory. Research at the Atlanta Federal Reserve Bank argues that one should not blame millennials for the absence of first time buyers. The age distribution of first time buyers has not changed much since 2000; if anything, the median age has dropped slightly. Other research at the New York Fed points to the size of mortgage down payments as a key factor. The difference between a 5% and 20% down payment, particularly for people who currently rent, has a huge impact on buyers’ willingness to buy a home. Mortgage rates are far less important to first time buyers than down payments.” Probably the biggest misconception in the market is the idea you must have 20% down. Markets are lower after Chinese stocks dropped 8% overnights. Bonds and MBS are up. Durable goods orders came in at 3.4%, a good reading. Durable goods ex-transportation rose 0.8% versus the 0.5% estimate. Capital goods orders rose 0.9% while shipments fell. The Capital Goods number is used as a proxy for business capital investment – businesses look like they might be investing in capacity in the future, but so far they aren’t. The biggest event this week will be the FOMC meeting on Tuesday and Wednesday. No one expects the Fed to raise rates at this meeting, since there is no press conference. The drop in commodity prices certainly gives the Fed room to hold off on raising rates. Some economists think the Fed might actually be closer to hitting its 2% inflation target than the consensus seems to be. The key is wage growth. And so far, it is nonexistent. Speaking of commodity prices, here are the states which have the most exposure to commodity prices. The top nine states on the map got at least 10 percent of their gross state product from energy, mining and agriculture last year: Wyoming, Alaska, North Dakota, West Virginia, Oklahoma, Texas, New Mexico, Louisiana and South Dakota. There is a massive spread between the states, with Wyoming getting 36% of its state domestic product from mining and agriculture, versus places like Connecticut, which gets 0.2% from mining and ag. 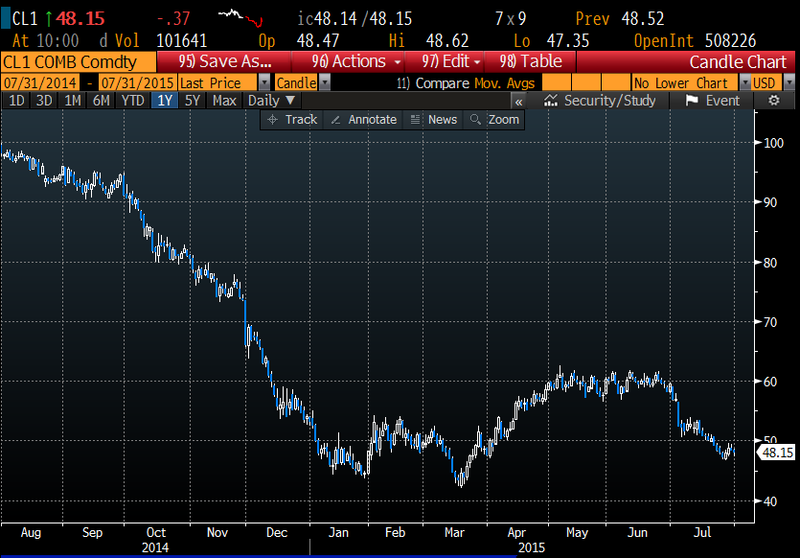 We will get a read on Texas (almost 15%) tomorrow when homebuilder D.R. Horton reports tomorrow morning. Overall, don’t sweat the drop in commodity prices on the economy. While it does hurt earnings in the oil patch, most people are users of commodities and benefit from lower prices. Hillary Clinton is going to push her plan to end “corporate short termism,” by raising capital gains taxes. Not sure how that is going to help, but she has her story and she is sticking to it. She is going to review securities regulations in order to help companies defend against activist investors. Not sure what her corporate governance vision is (I am afraid to ask), but essentially her goal is to compel companies to shift the amount they plow into stock buybacks into “investment,” whether that is capital expenditures or salaries. I hope this is just specious pablum for the Democratic party base – because it demonstrates a gross ignorance of how companies make decisions. Not only that, but government induced “investment” creates gluts which cause bad busts. Always has, always will. We are still digging out from the last glut (residential real estate). Markets are flattish on no real news. Bonds and MBS are up. Amazon.com reported good numbers last night and is now the biggest retailer in the US, by market cap, surpassing Wal Mart. Last year, Walmart made $16 billion on $485 billion in revenue. Amazon. com lost $130 million on $89 billion in revenue. New Home sales unexpectedly fell to 482k in June from a downward-revised 517k in May. Strange number given what we are seeing in housing starts / building permits, and numbers from the homebuilders. The median new home price fell 1.8% to $281,800. Hillary Clinton is bemoaning the “tyranny of short-termism” in Corporate America. She wants to hike capital gains taxes, play with the tax code regarding executive compensation, and rein in activist investors. I hope someone in her staff whispers in her ear to google the term “agency costs” and has her read up on Armand Hammer. I am guessing this is just red meat for the base. Sustainable Finance MBAs are having a rough go of it finding a job. Not surprising. Who wants a Social Justice Warrior managing their money? Maybe a union or a church. Not anyone who is concerned with, you know, actually making money. The business schools should be upfront about the job prospects for majors like these before students take on six figures worth of student loans.